This tutorial will cover the basic procedures for creating a rich media presentation using Adobe Presenter. This tutorial will demonstrate the process using PowerPoint 2007. 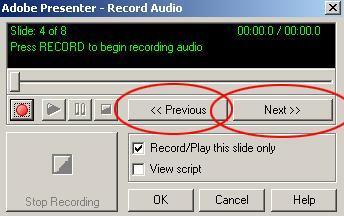 If you are using an earlier version of PowerPoint, the process will be similar. Please note that this tutorial is only intended to help you get started. There are many features in Adobe Presenter that will not be covered in this tutorial. After you are comfortable with Adobe Presenter, we encourage you to explore the other features and settings available in Adobe Presenter. Information on obtaining, installing and using Adobe Presenter 7 is included below. Obtaining Adobe Presenter 7: If you are interested in using Adobe Presenter, please contact Abigail Laufer. The iSchool will provide you with a license for Adobe Presenter, which you can use while you are actively teaching for the iSchool. Note that the iSchool may check with faculty periodically to verify that they are actively using their license. When requesting Adobe Presenter, please allow 5 – 7 business days for the processing of your request. After your request is processed, Abigail Laufer will provide you with download and license key information for Adobe Presenter. Installing Adobe Presenter: The URL and login for downloading Adobe Presenter will be included in the information that you receive from Abigail Laufer. The file that you download will be named Presenter_WWE_ESD1.exe. Download the file and save it somewhere on your local computer. After the download is complete, double-click on the file to run the Adobe Presenter setup program. Create your PowerPoint presentation and save it. To use Adobe Presenter, first open your PowerPoint presentation in PowerPoint 2007, and then click on the Adobe Presenter button. We’ll be discussing the basic features under the Audio area and the Presentation area. 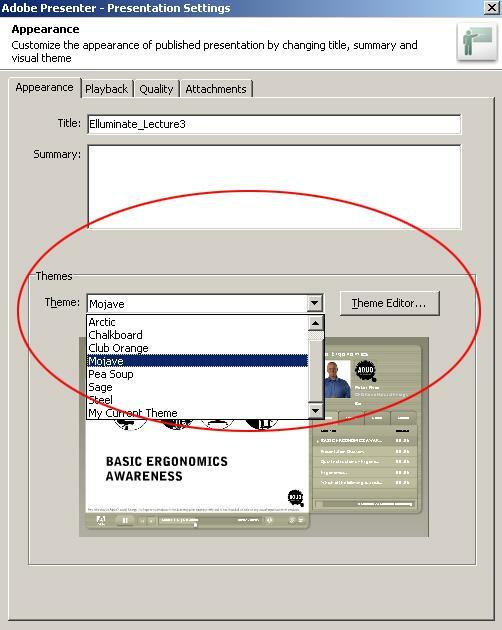 Changing your theme: Before publishing your presentation, you may want to select a different theme, or use the Theme Editor to create a custom theme. (A “theme” defines the colors, appearance, and layout of your presentation). Publish Presentation screen: See the additional information underneath the screenshot to help you determine what settings you need to choose. My Computer -> Location: Specify the folder on your local computer where the presentation will be published. In the example, we’ve created a subfolder named “Week1″ underneath the top-level folder named “MyPresenterFiles”. It’s up to you how you want to organize your folder structure. A basic setup might be to create a top-level folder and then create subfolders underneath for each of your presentations. That’s the model we’ve used for these tutorials. However, you’re free to use whatever folder structure works best for you. 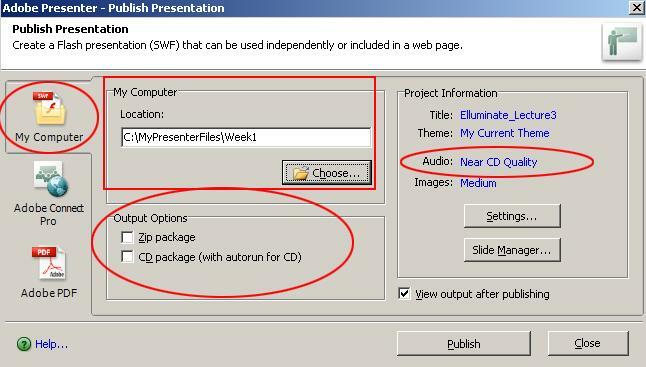 Output Options: What you select here depends on whether you will be uploading your presentation using SFTP or using the Web-based upload interface. 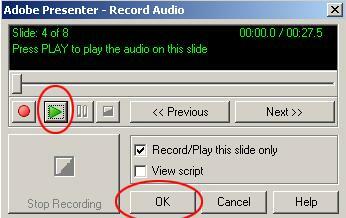 Audio: Near CD Quality: This is the default setting and we strongly recommend that you do not change it. 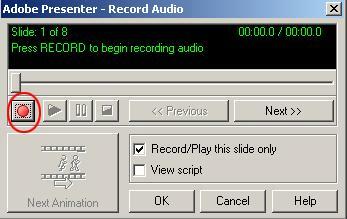 This quality level is the minimum required for us to obtain transcription of your audio. 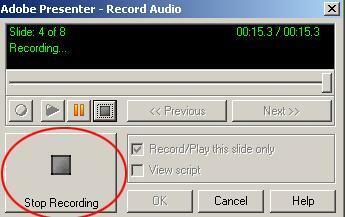 So please leave audio at the default of Near CD Quality. If you plan on uploading your presentation using the eXtplorer Web-based upload interface, click here. If you plan on uploading your presentation via SFTP, click here. Captioning your presentation: We are required by CSU policy and state law to provide accessibility for all types of multimedia, including rich media presentations created using Adobe Presenter. Please read through the following tutorial for instructions on captioning your Adobe Presenter presentations. Because of the mandatory nature of this process, we appreciate your cooperation in helping the iSchool comply with CSU policy and state laws regarding accessibility.